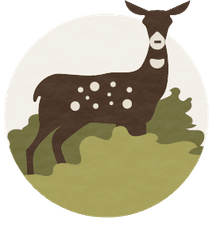 There's an important concept in biology known as "convergent evolution:" animals that occupy similar evolutionary niches tend to adopt roughly similar forms. Ichthyosaurs (pronounced ICK-thee-oh-sores) are an excellent example: starting about 200 million years ago, these marine reptiles evolved body plans (and behavioral patterns) strikingly similar to those of the modern dolphins and bluefin tuna that populate the world's oceans today. Ichthyosaurs (Greek for "fish lizards") were similar to dolphins in another, perhaps even more telling way. It's believed that these undersea predators evolved from a population of archosaurs (the family of terrestrial reptiles that preceded the dinosaurs) that ventured back into the water during the early Triassic period. Analogously, dolphins and whales can trace their descent to ancient, four-legged prehistoric mammals (like Pakicetus) that gradually evolved in an aquatic direction. Anatomically speaking, it's relatively easy to distinguish the early ichthyosaurs of the Mesozoic Era from more advanced genera. The ichthyosaurs of the middle to late Triassic period, such as Grippia, Utatsusaurus, and Cymbospondylus, tended to lack dorsal (back) fins and the streamlined, hydrodynamic body shapes of later members of the breed. (Some paleontologists doubt that these reptiles were true ichthyosaurs at all, and hedge their bets by calling them proto-ichthyosaurs or "ichthyopterygians.") Most early ichthyosaurs were fairly small, but there were exceptions: the gigantic Shonisaurus, the state fossil of Nevada, may have attained lengths of 60 or 70 feet! Although the exact evolutionary relationships are far from certain, there's some evidence that the appropriately named Mixosaurus may have been a transitional form between early and later ichthyosaurs. As reflected by its name (Greek for "mixed lizard"), this marine reptile combined some primitive features of early ichthyosaurs—a downward-pointing, relatively inflexible tail, and short flippers—with the sleeker shape and (presumably) faster swimming style of their later descendants. Also, unlike the case for most ichthyosaurs, fossils of Mixosaurus have been discovered all over the world, a clue that this marine reptile must have been especially well-adapted to its environment. The early to middle Jurassic period (about 200 to 175 million years ago) was the golden age of ichthyosaurs, witnessing important genera like Ichthyosaurus, which is represented today by hundreds of fossils, as well as the closely related Stenopterygius. Besides their streamlined shapes, these marine reptiles were distinguished by their solid ear bones (which conveyed subtle vibrations in the water created by the movement of prey) and large eyes (the eyeballs of one genus, Ophthalmosaurus, were four inches wide). 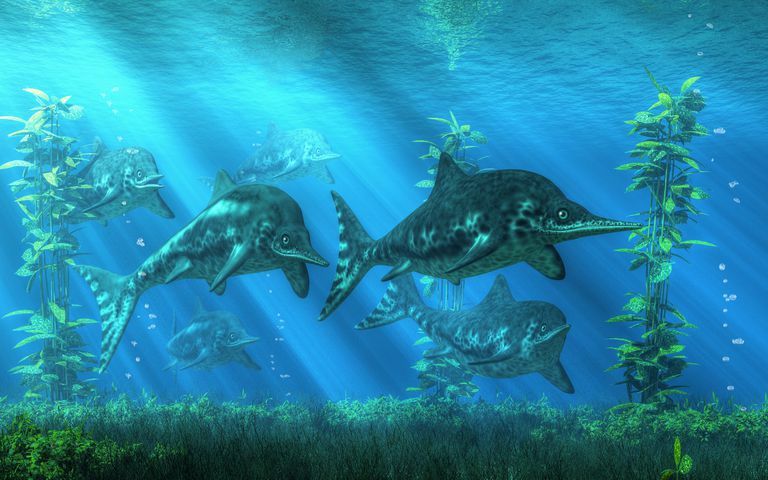 By the end of the Jurassic period, most ichthyosaurs had gone extinct—though one genus, Platypterygius, survived into the early Cretaceous period, possibly because it had evolved the ability to feed omnivorously (one fossil specimen of this ichthyosaur harbors the remains of birds and baby turtles). Why did the ichthyosaurs vanish from the world's oceans? The answer may lie in the evolution of speedier prehistoric fish (which were able to avoid being eaten), as well as better-adapted marine reptiles like plesiosaurs and mosasaurs. However, a recent discovery may throw a monkey wrench into accepted theories about ichthyosaur evolution. Malawania plied the oceans of central Asia during the early Cretaceous period, and it retained the primitive, dolphin-like body plan of genera that lived tens of millions of years before. Clearly, if Malawania could prosper with such a basal anatomy, not all ichthyosaurs were "out-competed" by other marine reptiles, and we'll have to adduce other reasons for their disappearance. Finally, for all their fish-like characteristics, ichthyosaurs possessed lungs, not gills--and therefore had to surface on a regular basis for gulps of air. It's easy to imagine schools of, say, Excalibosaurus frolicking above the Jurassic waves, perhaps sparring with one another with their swordfish-like snouts (an adaptation evolved by some ichthyosaurs to spear any unfortunate fish in their path).